In the same breath, after learning the intent of Aitken’s poem and its connection with Charles Babbage, I researched the life of Babbage and began to design the poem organically. Designing tends to be a visceral experience for me, and as a result, the visual themes of absence and gradient holes took hold. 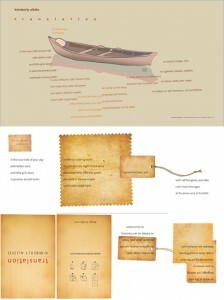 I hope I designed a broadside that is pleasurable to Aitken and the heart of the poem. I think it’s safe to say that Melissa has successfully captured at least our hearts with her gorgeously illustrated design! 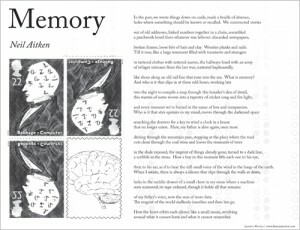 Melissa’s lovely interpretation of “Memory” is available in two forms—as a printable .pdf, and as a desktop wallpaper—and can be downloaded at our “Digital Broadsides” page. We hope that you’ll download both—and that, especially if you hang or leave a copy of the printed version in a public space, you’ll share a picture with us (on Facebook, on Twitter, or by email), and tell us about any stories that might be generated when others encounter it. Happy Friday, everyone! As we explained in our update on Monday, we’re celebrating National Poetry Month this year by offering a series of free Digital Broadsides, designed by Asian American designers (many of whom are poets themselves), and featuring poems from past issues of LR. 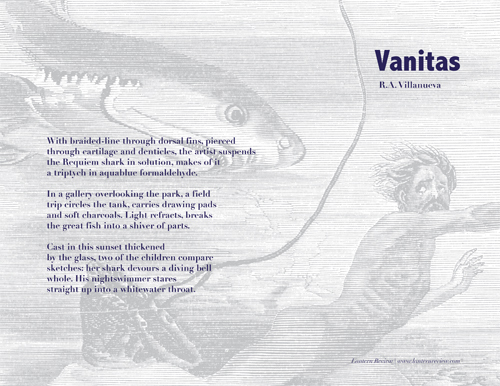 Today’s broadside, which showcases R.A. Villanueva’s “Vanitas” from Issue 4, was designed for us by the talented Debbie Yee, a poet, Kundiman Fellow, and print artist who lives and works in San Francisco. Debbie’s design for “Vanitas” is available for download in two formats—as an 8.5″ x 11″ printable .pdf, and as a desktop wallpaper (in three different sizes, to fit screens with 4:3, 16:10, and 16:9 aspect ratios, respectively). Click here to visit our new “Digital Broadsides” page, where you can download the broadside in your format of choice. As a multi-disciplinary artist, Debbie often combines her interests in the visual with her writing and knowledge of bookmaking in order to produce beautiful short-run chapbooks and other pieces of literary art. For her latest project, which is funded by a grant from the San Francisco Arts Commission, she has committed to giving away 100 copies of her own handmade chapbook, Handmade Rabbit Society, in exchange for each recipient’s sharing the name of a self-published or small- or micro- press chapbook that he or she has purchased in the last 18 months. The goal of this exchange project, Debbie writes on her web site, is to turn more “people on to the chapbook format and [introduce] the work of emerging poets and writers.” You can read more about Debbie’s project and find out how to participate on her site, Linocat. We hope that you’ll take a moment to download, print, and post Debbie’s beautiful interpretation of “Vanitas” somewhere where others can see and encounter it—perhaps a bathroom stall, a classroom, a bulletin board, a door, a refrigerator. If you post a copy somewhere public or have stories to share about what happens when you do, we’d love to hear about it. Send us an email (editors [at] lanternreview dot com) with a photo and an explanation, or, if you’re on Facebook, upload a picture of where you hung the broadside, and tag us! (@Lantern Review). When National Poetry Month is over, if we gather enough stories and photos, we’ll do a little feature post highlighting some of our favorites here.